The timeline for LLNL/GA target development depends on the complexity and novelty of the target design. If the target has been previously fabricated, then the design need only be supplied to NIF Target Fabrication for review three months before the experiment. For new designs, Target Fabrication will generally need four to six months before the experiment for evaluation, planning, and production. In either instance, target fabrication should start with a campaign review for the Campaign and Shot Responsible Individuals (RIs) to lay out long-term target needs for their campaign, at which the Target Fabrication team will provide input on how these needs can be met. 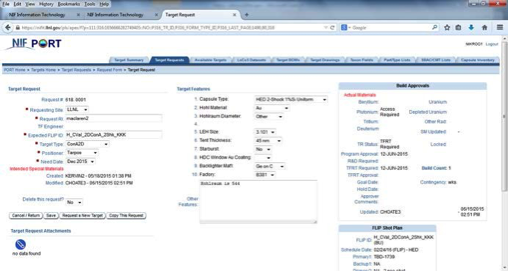 A Target Fabrication Change Control Board (CCB) manages changes in target schedule and development. The general target engineering process for new target designs is as follows. The Shot RI (who is either the Principal Investigator (PI) or the liaison scientist) brings the target design and physics requirements to Target Fabrication as soon as an experiment is approved, and before it is scheduled, to discuss design feasibility. For Inertial Confinement Fusion (ICF), High-Energy-Density (HED), and National Security Applications (NSA) experiments, approval from the appropriate council is typically 12 to 9 months (at a minimum) before an experiment is scheduled for a shot. For Discovery Science (DS) experiments, the approval by the NIF director is typically given 24 to 18 months before the shot. A drawing of the target should be provided with sufficient information for NIF Target Fabrication to assess the cost and effort required for development, production, and fielding. The drawing should include dimensions and all materials to be used and should call out the use of any hazardous materials. Target Fabrication will provide design feedback, discuss target materials research and development (R&D) needs, and create a time estimate. a conceptual design and drawings indicating dimensions and tolerances. Focus is put primarily on experiments occurring six months out on a rolling basis. Of course, earlier identification of any target design issues always increases the margin of success. Target specifications must be agreed to well before the target is built. A target request form (TRF) initiates the fabrication process (see Figure 7-1). Before fabrication formally begins, safety (unconverted light and backscatter), debris (calculation of ejected material), alignment (agreement on needed fiducials, measurement techniques used and verified), self-consistency, special materials, and target mass must be verified. The Shot RI works with representatives from target engineering, the alignment team, the metrology group, and target operations to uncover and resolve any physics, safety, and cleanliness issues early in the process. Any dependencies of the design on target materials R&D should also be identified. Further, the Shot RI, together with NIF, must develop a target alignment plan/strategy. Typically, this process runs continuously from the approval of the experimental proposal, and all issues of the types described above are resolved and any problems mitigated three months before a scheduled shot date. Figure 7-1. The Target Request Form, available via the National Ignition Facility’s (NIF’s) PORT system. If it is determined during target metrology that a target or target component does not meet specification, then the target will be evaluated by NIF’s Management Review Board (MRB) to determine if the target should still be shot, if the specification was reasonable, and whether the experiment can be performed as planned. Target delivery to the NIF facility is expected to be no later than two weeks before the scheduled shot date. Shot RI review of the metrology data in the RVP needs to be done at least three weeks before the shot date in order to confirm that all aspects of the target are consistent with what is required to perform the shot. The general target engineering process for existing target designs is as follows. If the target design is identical to previously fabricated targets, the Shot RI (who is either the PI or the liaison scientist) completes the TRF (see Figure 7-1) on the NIF IT/PORT system with help from Target Fabrication. If there are any changes to the target design, it is considered a new target design and follows the process described above. Since experiments are scheduled on a rolling basis 6 to 12 months in the future, the TRF should be completed no later than 6 months before the scheduled shot date. Reasons for rejection/revision might include poor definition or too short of a lead time. If it is determined during target metrology that a target or target component does not meet specification, then the target will be evaluated by NIF’s MRB to determine if the target should still be shot, if the specification was reasonable, and whether the experiment can be performed as planned. Shot RI review of the metrology data in the RVP needs to be done at least three weeks before the shot date in order to confirm that all aspects of the target are consistent with what is required to perform the shot.